Well, we finally did it–now that Andrew got back from a jaunt to France, we sat down (figuratively) to chat about N.T. Wright. This will be a two-parter and in this episode we introduce Wright’s work, chat about his popularity, a few criticisms, and so forth. The second will follow up and address Reformed criticisms of Wright’s work. I’ll be honest, this was a fun one that I think you’ll enjoy. As always, please feel free to share, review, and rate us on iTunes. Also, various show notes are linked over at Mere Orthodoxy. 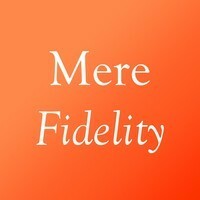 I have been reading your stuff for quite a while now and I was interested to see you that you and another friend have an audio chat “Mere Fidelity”. I have tried a couple of times to listen but not succeeded. I do not have I tunes on my laptop because I find it very intrusive and I don’t have an I player so how can I listen in some other way please? Is it possible? I would particularly like to hear your latest audio as I too am an Anglican and I think many have a lot of good things to say which we don’t hear enough of. Funny! I had just reading Jesus and the Victory of God the evening before this new podcast came online. I’m taking some extra summer reading time to read/re-read Wright’s big series. I appreciate your look at not just Wright’s material but also his posture and rhetoric. I, too, am a appreciative admirer and critic of his (not a fanboy). I suspect in many respects Wright will have a similar impact to Barth. Traditional evangelicals won’t like everything he puts forth, they can appreciate what he’s accomplished, but will everyone will have to reckon with his work as the field of theology moves forward. Looking forward to part 2. Hopefully I’ll be well into The Resurrection of the Son of God by then. Derek! When we spoke via email I didn’t think you guys would get to this topic so quickly and I’m really glad you did. This was exactly what I was hoping for! I really appreciated the balanced pro’s and con’s, or shall we say the mature appreciation of Wright without all the “fanboy-ness.” This was super helpful and I cannot wait to hear the second episode! You’re welcome! Actually, we were going to do something along those lines anyways and so you gave us a little push there.